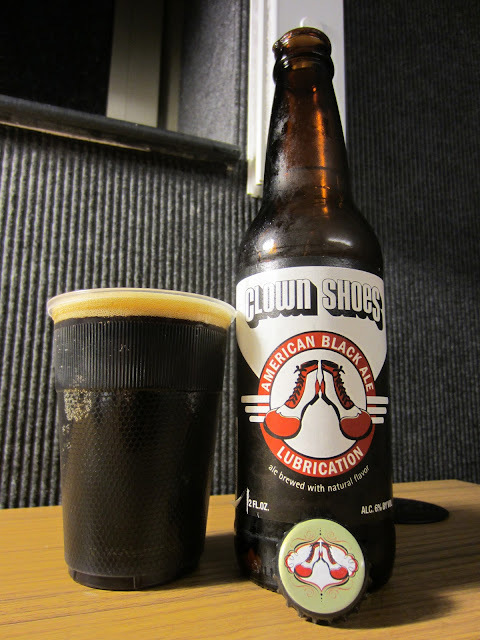 The Lubrication Black Ale from Clown Shoes/Mercury pours a deep brown body, pushing black with a ruby glow around its edges and on the pour. The full tan head is small, but creamy in consistency with a mild oily sheen. The head fades slowly and leaves light lace behind as it goes. The robust smokey nose features hints of coffee and a dry powdery essence on the back end. With a smooth and satiny mouthfeel the beer features a toffee sweetness up front. Slowly the sweets slide into a medium roast coffee with mild smokey notes. The beer seems dry with a vague mineral influence. From the mid-palate through the finish the flavor fades and leaves an exceedingly dry and lightly smokey finish.